“A new job and a better salary” – the exact words you don’t want to overhear from your employees on the topic of New Year’s resolutions. This is perhaps one of the most common New Year’s resolutions going, right up there with losing weight and quitting bad habits like smoking and drinking. As many as 2 in 5 people look for new jobs in January as a result of ‘back to work blues’. If we know January is a month for staff retention concerns, what can employers do to keep employees happy during this busy employment period? Here, Busy Bees Benefits explains how an up to date and relevant benefits package can excite employees for the January return to work. After the Christmas period, many employees dread the return to work. This may be for many reasons – the fear of going back to normality, worries about financial issues or irregular sleeping patterns playing havoc with working hours. However, the ‘new year, new start’ attitude is the number one factor for job moves at the beginning of the year. Employers can prevent this by refreshing their benefits package and rebranding their employer profile ready for the beginning of the year. Employees who are looking for more money can be helped by a range of money-saving benefits that can be accessed through their current workplace. 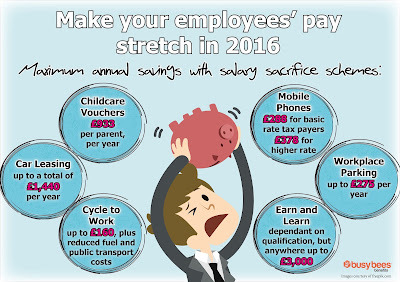 Often these benefits are a great way of making employees’ pay stretch when a pay rise isn’t available. 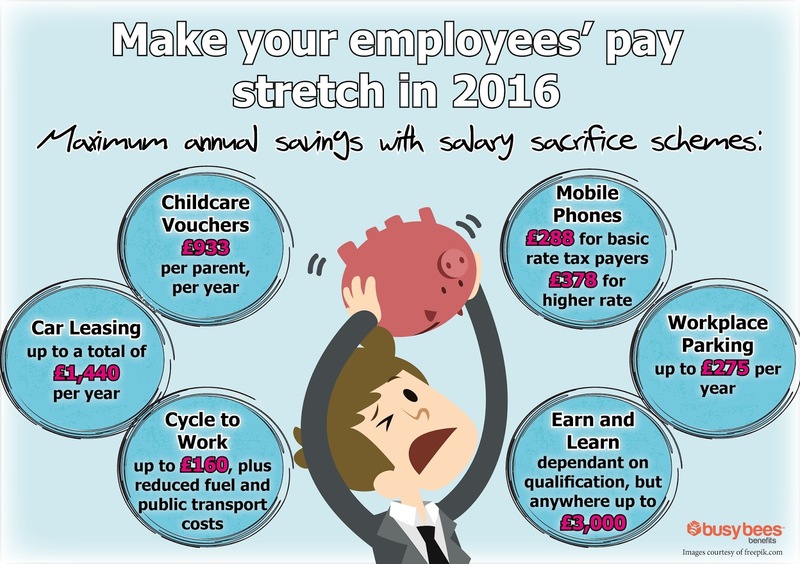 Salary sacrifice schemes help staff to make the most of their pay by accessing tax and National Insurance savings. The most well-known of the salary sacrifice schemes on the market is the Childcare Voucher scheme. Whilst this is a great scheme, there are also plenty of others that help employees save on different expenses by operating in a similar way. If you work out what your employees spend most of their pay on, you can then find out which schemes are best suited to your workforce, thus retaining your staff. A few salary sacrifice schemes worth noting are car leasing, mobile phones, cycle to work, earn and learn and workplace parking. All of these schemes also help businesses save money on National Insurance contributions. Salary sacrifice schemes are great but they’re not always for everyone. Due to certain financial circumstances, some employees may be unable to use salary sacrifice schemes. However, this does not mean that they should go without. If you have employees that cannot access salary sacrifice schemes, there are a range of other options available. The small cost of these schemes can either be covered by the staff members who require them or funded by your business. Examples of these schemes include; retail discounts – a scheme that gives employees access to exclusive discounts and offers on everyday purchases, car care – a scheme to help employees manage vehicle maintenance and will writing – a service that helps employees create a will at a discounted price. Don’t lose faith in the value of a great benefits package just because salary sacrifice isn’t feasible for all of your employees. Make sure you do your research on alternative benefits. Ah, the day we’ve all been avoiding – Blue Monday. This is thought to be the most depressing day of the year, falling on the third Monday of January. According to research, a combination of post-Christmas blues, cold dark nights and the arrival of unpaid credit card bills hits employees particularly hard on this day of the year. The effects of Blue Monday don’t just disrupt employees either; they also affect employers too – with as much as £93billion expected to cost businesses as a result of lost productivity. Prepare for the expected levels of depression by initiating an Employee Assistance Programme (EAP). These schemes help employees deal with everyday issues by providing an online help system and around the clock telephone counselling services. The confidential service aims to help resolve personal and professional problems that often impact behaviour in the workplace. Through an EAP, staff can receive expert advice and guidance on topics such as stress, depression, relationship difficulties, bereavement, and anxiety as well as legal and financial concerns. Blue Monday might be a force to be reckoned with but you can certainly do something to help put negative thoughts at bay. The ‘new year, new start’ attitude may be number one factor for job moves, but that doesn’t mean to say their new start has to be elsewhere. Your business can be perceived as a new place to start, after rebranding with the correct benefits and internal communications strategy. By boosting your employer profile and refreshing your benefits package, you’ll not only retain key staff, but you’ll also attract potential employees in the event of a retention disaster. Once you have your new benefits in place, it’s essential that you work with your benefits provider to establish marketing materials to work with your communications plan. The New Year encourages the ‘new start’ mind-set so show your employees that you’re willing to give your benefits package a new start too. You might find that the threat of lost employees is reduced significantly.